Once again John Boehner, the Republican House Speaker, has allowed a rightwing extremist cabal in Congress to control the fate of important legislation. Bowing once again to the wishes of the tea party, he has refused to put immigration reform to a vote in the House, all but guaranteeing that the comprehensive bill passed in the Senate will go nowhere for the foreseeable future. Boehner’s decision shows his total inability to lead his party to do the right thing in immigration reform, as his leadership has shown time and again in the past the total inability of the GOP to do the right thing on any matter important to working people or their allies. Republicans are saying this week that there was no time left to tackle immigration reform this year. Yet they have found plenty of time to start phony hearings on the problems with the Obamacare rollout. Boehner himself has found time to bring to the floor and pass with almost unanimous Republican support a bill that would deport DREAM-eligible young people. 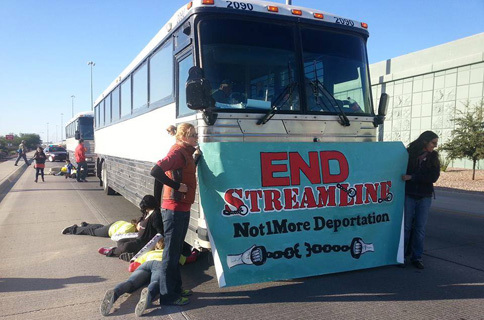 Every day 1,100 people are being deported – ripped out of their homes, away from their families and off their jobs. At the end of another year of this human tragedy the Republicans have nothing to show for themselves but additional disgraceful action that only adds to the human misery. The Boehner decision hurts the economy too, and therefore all Americans, by keeping millions of productive people in the shadows. These people are in every way, except on paper, fellow Americans. The peoples’ movements must not give up the fight until our lawmakers finally pass immigration reform. A first step would be to let Boehner know personally about the misery he is causing. Support the campaign by United We Dream to make 1,100 calls to Boehner. The idea is to call Boehner’s office on Nov. 20, one call per deportation. You can join the campaign by texting “boehner” to 877877 and you will receive a text with Boehner’s number to call on Nov. 20 to demand a vote on immigration reform. Beyond that, we must all make it clear that if Boehner’s House Republicans continue to block the path to immigration reform, if they continue to refuse to do what is right, we will make sure they pay the price on Election Day in 2014.